Habit trackers. You either love ’em or loathe ’em! I’ve used various different habit trackers during my time planning. I started off by creating custom weekly checklists that I would cut and stick in my planner. That then developed into monthly habit trackers for those things you don’t do every day. Then I got into bullet journaling and it was all about the monthly habit tracker. As you can see, I wasn’t that great at keeping up with them. When I moved away from the bullet journal and back into a planner I still tried weekly habit trackers. They still weren’t really working for me though, and I stopped using them for the longest time. Since I moved into a Hobonichi Cousin I’ve been back to using them and with great success. I now generally use five different weekly habit trackers across both my Hobonichi Cousin, and Weeks. Why are habit trackers working so much better for me now? They weren’t realistic, and I set myself lofty goals without any build up. I beat myself up when I didn’t meet them which then affected my future adherence to them. So I re-evaluated what I wanted to track. Instead of thinking up lots of things I thought I should be doing I picked a few things I knew I wanted to do. Things that were achievable but not already doing consistently. I also adjusted my mindset – knowing full well that I wouldn’t always achieve the thing every single day. And that that’s okay. In the early days I also switched out what I was tracking each week. That’s the beauty of tracking something weekly instead of monthly. If I knew something was unattainable (such as eating below my calorie goal when I had lots of meals out planned) I just didn’t track it that week. Or if I’d realised that I’d set myself too large of a goal, I could skip it for a few weeks and build up to it. Recently I started trying to hit 10k steps a day. I failed miserably initially, so stopped tracking it for a bit to give me chance to build up to it. I wasn’t just going to start hitting it overnight, I needed to make some adjustments such as parking further away from the office. It’s now back as a habit in my planner and I’m either hitting the 10k or getting close most days now. Having weekly habits also allows me to track something that might only be relevant for a short period of time (more on that below). As with all of my planning I tried to make tracking fun. No boring checklists for me! How could you not keep to habit trackers this cute!? The super cute water bottle is part of this Friday's new releases and everything else is ok the shop now! Instead of writing my habit, I use stickers to indicate what I’m tracking. Here I’m tracking takeaway coffees as I’d got into a habit of buying coffee most days which is bad for the purse! Every day I didn’t buy one got checked off (I achieved all week!). I only tracked this for a week and didn’t have to again for a while as it nicely kicked that expensive habit. The next thing I’m tracking here is water intake as I aim for two litres a day. For hitting my calorie goal I like to use stickers like pizzas and burgers. This always amuses people on Instagram as they think I’m tracking my burger eating! I’m currently tracking five different things at the moment: water intake, calorie intake, taking lunch to work, using my mouth guard and taking my medicine. I decided to split these up across my two planners with the Cousin holding my more ‘home’ related habits and my Weeks holding the water intake and calorie habit tracking. I like having them broken up as five habit trackers each week would probably take up all of my sidebar in my Hobonichi. It’s also not as overwhelming as when I open my planner the most I need to see are three checklists. I’ve had great success with my new habit trackers. I’m really happy with the strong habits I’ve been building so much so that some can stop being tracked now, because they have become exactly that – a habit. My current habit tracking has all been centred around health. 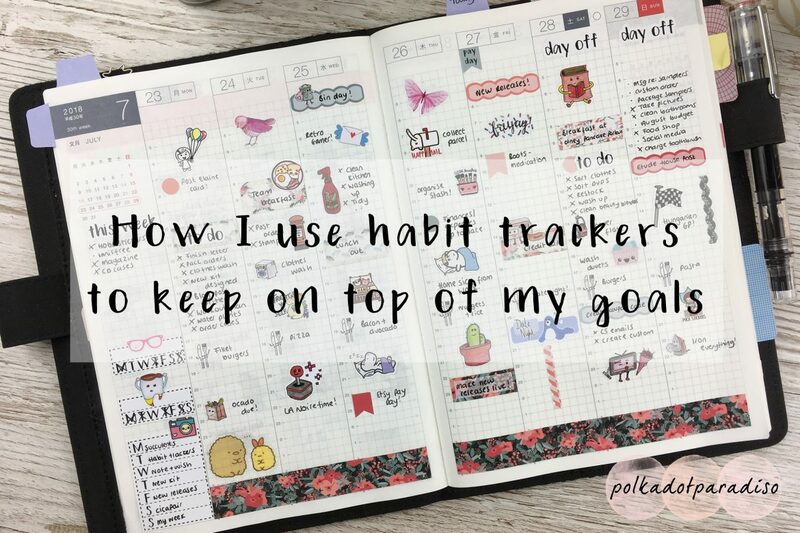 The next step in habit tracking therefore is to start incorporating them into my goal planning. I have some big goals for the shop and blog over the next four months and I know there will be different things I need to focus on each week. I’m interested to see how that goes and whether it helps. I’ll be doing some planning over this weekend and intend on adding some new habits to my trackers next week. If you’ve ever incorporated business planning into your habit tracking, I’d love to know how you did it – drop me a comment!